Great article Darin! 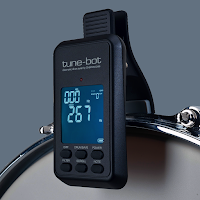 That is very helpful information in regards to both tuning, and tune-bot use. they recommend against tuning higher than 400hz because the tunebot is not rated to go above 400 hz. I have got a cell phone app tuner to supplement when tuning higher than 400hz. It's a great tool though, demystifies a century or drum tuning in which people just had crude "folk' methods of tuning. It hasn't caught on yet, but now the drum kit is able to be a tonal or melodic instrument. I use it mainly as a drone, like the tabla, tonally speaking. Also, I have just discovered that not only can you tune the fundamental and lugs, if you know what you are doing, you can actually tune the prominent upper partial, mainly of the snare drum. I have gotten this wonderful sonorous snare sound out of my 10' snare, but it would be elusive and when I lost it, it would ge gone until I just used trial and error for a long time to get it back But then I discovered I could get this upper harmonic a fourth up from the lug frequency sometimes, and that was what was causing the harmonic sound. So I got a spare snare drum, tuned it t the fourth above, then locked in that frequency n the tunebot, and used it to tune the snare harmonic. But its still not easy, it's still trial and error to get the lug and fundamental frequencies I want while maintaining the harmonic. What I found is that the method you use to pull the head to tension, whether star pattern, or circular pattern, two keys instead of one, etc has a huge effect on the upper partial. It doesn't make sense why this would be, but maybe I will figure it out one day. Very interesting...so if I understand what you are saying, there is a desirable upper harmonic that comes and goes at a given lug frequency? Obviously no drum shell is perfectly consistent, round, and true, no bearing edges are perfectly cut, no hoop is perfectly round, no head is perfectly uniform, etc. However on a quality drum with excellent bearing edges, the big variable is the drumhead. We can't control the consistency of the drumhead, but we CAN adjust the bearing edge-to-drumhead contact through the seating process. I can't tell you how many times I've tuned up a drumhead to a specific lug frequency with subpar tone, then detuned, reseated and tuned the same head back up to the same lug frequency and achieved that tone nirvana you are referring to. Your last paragraph has me wondering if your drum is especially sensitive to seating. My 6.5x14 Acrolite is like that. I just keep reseating the batter head until I achieve "the tone." Unscientific, I know, but there is no other way I know of to fix suboptimal bearing edge-to-drumhead contact. I suppose it's possible through trial and error to determine whether tuning one or more lugs to slightly different frequencies would result in a more scientific/repeatable process to achieve tone nirvana, but then you play the drumhead, it stretches, and then what? Let me know if you do figure it out!